I received a “Suggest a Joint” request from Cindy who claims that the wings at the Court Jester are sensational. There are two locations: one in Freehold and the other in Aberdeen. Though the food is supposed to be the same at both locations, we chose Aberdeen because we were told that it had more table seating. Also since this is in my old man’s neck of the woods, I decided to take this opportunity to invite him out to eat with us so he can get some good grand kid time in while we tested out the wings. I entered into this saloon with high expectations as Cindy is a very reputable source for good food. We sat at a large booth, sipped on our Monster Mugs of beer, and even though I looked over the menu, my mind was set on the one and only chicken wing… which according to THIS menu was “New Jersey’s Best.” As I placed my order of the “Regular” 9 piece wings with a side of what they call “Atomic” to see how nuclear it could be, my family ordered up a conglomeration of food consisting of things like: Baby Back Ribs, Spaghetti, Quesadillas, Wraps, and Clams. When the food arrived, everything smelled and looked great, but I was taken aback when I looked at the wings they placed in front of me. They didn’t look like anything fancy as I stared at their average size and normal side dishes. Nothing that stood out and screamed “I am going to taste AWESOME! !” Just a typical plate that I would expect to find anywhere. I disappointingly grabbed the first piece and began to nosh away only to find out how insanely wrong I was. This is a classic case of don’t judge a book by its cover as these things packed some major flavor. The wings themselves had that slow cooked smokey taste that I love and seem to only find in a lot of BBQ type of places. I wonder if there is any correlation between cooking good ribs and cooking good wings… I may have to investigate that further. The meat had a nice tenderness to it, and still packed serious flavor even when I stripped it from the skin and sauce. The sauce only added to the taste and itself had a BBQ-like quality to it with a thicker consistency, but with the heat and spice that I crave. My only wish for the sauce would be for it to be a little hotter, so I cracked open the “Atomic” to see how that favored over the other sauce. It was definitely hotter than the “Regular” but was still nothing crazy, so I mixed the two together and that seemed to do the trick. Overall, the wings were great at Court Jester, and if I could suggest anything to make them better it would be to add more spice to the skin, a little size to the wing, and a little more heat to the sauce. But those are small changes to make an already great wing excellent. As an extra bonus, if you are in the area on a Sunday and you have little ones, swing on in with the kids and save some dough as they eat free (and that’s always a plus). 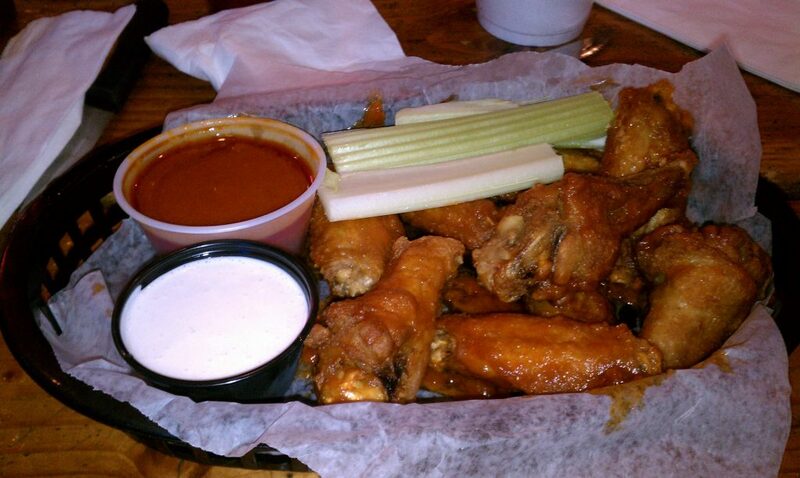 Either way, I recommend stopping in and grabbing a plate of these wings because they will keep you coming back for more.